A reception from 5:00-6:00 p.m. in the museum’s lower gallery. Claire Van Vliet is an artist working mainly in lithography and paper pulp paintings. 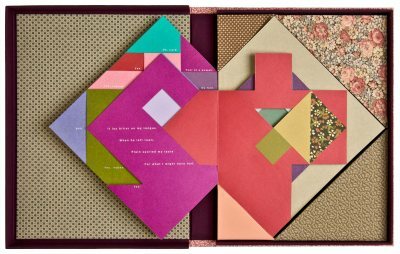 She is also a book artisan, illustrator, and typographer, and, in 1955, founded the Janus Press, which publishes collaborative works by contemporary writers, papermakers, printmakers, and artists. Some of the co-creators of Janus Press books are authors, Raymond Carver, Tess Gallagher, Seamus Heaney, Ted Hughes, and John le Carré; artists, Ruth Fine, Susan Johanknecht and Jerome Kaplan; and papermakers, Katie MacGregor and Bernie Vinzani. In 1989, Van Vliet was honored with a “genius grant” from the MacArthur Foundation for her work as a teacher and artist. Several of her prints are featured in the Literary exhibition on view in the museum through March 23. The Bates College Museum of Art serves as a major repository of Van Vliet’s prints.